Lutterworth Town are gearing up for a couple of games which could go a long way to shaping their season. The Swifts travel to Rushden & Higham United on Saturday looking to get the better of one of their rivals for a promotion spot in United Counties League Division One. Then, seven days later, they host the same opponents back at Dunley Way in a rapid return meeting. With Rushden sitting just a point and place ahead of Lutterworth the games have huge significance in how the season will turn out for both teams. “It’s a massive double header,” Swifts boss Josh Dixon admitted. “We’ve got to look to come away with at least four points from the two games – that’s a minimum. “We’ll obviously go into it looking to win both but it will be tough with playing the same side back to back. “It’s almost a Champions League-style scenario and it is one none of us are used to. “I’ve only done it once before and that was in a cup game. Dixon will certainly be happier with his side’s prospects now than couple of weeks ago. 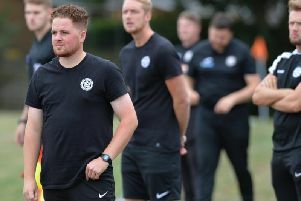 They earned a good draw at second-placed Raunds Town a fortnight ago and followed it up with a win over Huntingdon Town. But that came after convincing losses to both Melton Town and Olney Town in their first matches of 2018. Dixon explained: “We were a shambles at the start of the year. “I don’t know what happened between Boxing Day (when they beat Lutterworth Athletic 1-0) and Melton. “We were like an entirely different team. “Thankfully we gave a good account of ourselves at Raunds and then got a good win against Huntingdon. “It keeps us where we wanted to be. “We said we wanted to be in the position at the end of January to still be in touching distance of promotion. “With just over 10 games to go we’ve still got something to play for and, if we can get some good results to lift us above Rushden & Higham, then we are still in it.